Shifting is the name given to a technique which is of great value in the effort to relieve any unnatural tension in the mechanism of vision. The practice is based on the habit of the eyes. When acting normally the eyes are shifting, constantly and instantaneously, the point of central fixation. That means that the eyeball itself is in constant motion. 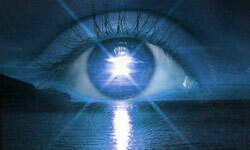 The attention of the visual center likewise is shifting to meet each change in the focus of the eyes. To visualize even a small letter, the eyes must receive rays of light refracted from all the parts of the letter. It is plain that one cannot know the shape of any object, its angles, and curves, and colors until one has focused on its outlines. This necessitates the constant motion of the eyeball in vertical and horizontal directions- That motion is so slight, as a rule, that one is entirely unconscious of it. Generally it can be demonstrated by the ophthalmoscope, because that instrument covers the eye being observed, and the other eye is moving, and the ophthalmoscope shows that the covered eye is moving in unison with it. A letter, or a word, or any point, may appear to move in different directions; and with a normal eye this can be observed sometimes, with just a little attention. That is because the eye is moving in the opposite direction from that in which the point seems to move. It is worth while to fix the eyes on a letter, and then shift the focus abruptly to the left or the right side, or to the top or the bottom. The letter will seem to move in the opposite direction. This can be demonstrated with a word, or with a line, or with any small object. In a dark room with a soft light on a small object, it is easier to prove the truth of this. Sometimes the demonstration is facilitated by moving the head back and forth in a short range, while looking straight ahead. and finding that very soon the object seems to be moving, and not the ‘head. Conversely, if one selects a point and demands of the eye that it continue to hold the focus unmoving, there develops what is called a stare. A strain is quickly felt, and if the focus is not shifted, the point will blur or even disappear. If the conduct of the eye is not normal, it may not move so rapidly. With the ophthalmoscope, the movements are seen to be slower and more noticeable. On the bottom line of a Snellen Test Card there are fourteen letters. At a distance of ten feet, one seems to see the fourteen letters at one glance. But it is necessary for the eye to make four shifts to each letter. In a mere fragment of a second there are seventy shifts, and the eye and mind are unconscious of them. When one looks at a moving picture for instance, to encompass the flashing changes over the area of the screen involves a number of movements on the part of the eye, which it is not possible for the mind to realize. When the mind and the eye are functioning normally, all of this is accomplished with ease. To consider for a moment, in passing, the constant mo- tion of the eye muscles which is involved in this necessary changing of the position of the eyes, is to realize the falseness of any method, or claim, which involves practices designed to strengthen the eye muscles. From birth, those muscles have been in constant action and do not need any extra work. Further, the eye muscles act automatically, under specific impulses from the mind. What is called imbalance of the eye muscles, meaning a want of co-ordinated contractions, can have only one explanation – it must mean disordered nerve impulses. Whatever the procedure, to correct abnormal impulses sent to muscles, it is necessary to exert an influence on the control center in the brain. To make the conscious mind aware of the presence and the value of this habit of the mind, different practices are offered, and individual patients may find some more helpful, in their particular case, than others. A simple procedure is to draw a small circle on a large square of white paper, and fill it in with black ink, except one tiny spot where the white paper is not covered and stands out in contrast as a white period. Throw a good light on the period, and keep the mind occupied exclusively with that period. Blink softly at the period for half a minute, then close the eyes for half a minute and keep the mind on the white spot. Soon an after-image will appear when the eyes are closed. If one can do this in a dark room, with a 300 watt light backed with a reflector ten inches in diameter throwing a spot light, while the eyes are behind in the dark, it will facilitate the result in many ways. When the visual center has become familiarized with the white period, it will be well to make a circle three inches in diameter, and have two such white periods in it, two inches apart. Focus on one of the periods, and ascertain whether the other period is less clear, or just as clearly seen, or seen more clearly. Close the eyes for a minute and then focus on the other period. If the period focused on is always seen bet ter than the other, the central fixation is normal. With proper care, it is possible to demonstrate whether such is, or is not, the case. Whether the above be demonstrated or not, it will improve the sight to imitate consciously the unconscious shifting that the normal eye performs. Such a practice rests the eye, and encourages a normal function. If the period shifted from is seen better than the period shifted to, it will be necessary to practice with two periods more widely separated. Ink periods on white paper will serve for this. When the distance is found at which one of the periods is lost when focusing on the other, it is a good practice to flash the glance back and forth rapidly until the eyes feel rested, and one gets the illusion of a swinging on the part of the periods. The distance between the periods can then be reduced gradually. One guide for this is the fact that the illusion of a swinging on the part of the periods is still in evidence. As the improvement in sight continues, the test can be used finally between the sides of even a small letter. It will be in order then, to see a swinging or pulsating movement of the letter when there is no conscious shifting of the eyes. In difficult cases, it may be necessary to use two lights for the practice, or two different objects, a sufficient distance apart. In some cases, it facilitates the improvement to prac tice on points close to the eye, and gradually increase the distance from the eye. It is always helpful to palm the eyes for a few minutes or longer at first, and then palm a short time frequently during the practice. It is not well to shift the focus too rapidly at first, and the shift should never be more rapid than two or three times in one second. It is a good practice to select two letters on a line and shift the focus back and forth between them. When the eyes have demonstrated, for a few minutes, that the letter being focused is always clearer than the other letter, it will be found that the letter focused will be clearer than it was at first, and the letters will each seem to move, as the eyes change, in the direction opposite to the movement of the eyes. Following that practice, one can work on a single letter, and demonstrate that when focusing at the top of the letter, the bottom is not as clear, and vice versa. If one looks at a spot above the top, or below the bottom, the whole letter will appear less clear, because it is out of focus, thus impressing that a correct focus is normal. When the eye becomes accustomed to such a practice, the letter will appear to swing in the opposite direction, as continuously as the movement of the eye, and the let- ter will be seen clearly during the movements. The ink of the letter will soon appear to be blacker, and to stand out more boldly. When any letter, perhaps a larger and heavier one, is easier seen than some other one, rest the eyes and encourage them, by focusing the plainer letter, and then shift to the letter which is not so clear. Alternating for a few minutes, the obscure letter will generally becomes clearer. When a large letter at a distance is not clear, it will help to focus on a clear letter nearer the eye, and then look at the distant one. Such an alternation will soon enable the eye to see clearly the obscure distant letter. The eye is relaxed at infinity, meaning that it stops straining often when it simply looks at some object at a great distance, and does not try to distinguish. It is possible to do this, and still focus on some point. The corner of a building, the top of a hill, the large letters of a sign, a distant automobile in motion, all will serve to rest the eye, and at the same time hold an attitude of central fixation in the mind. But there is to be shifting, between distant objects or from distant points to close points. The object of shifting is to imitate the habit of a normal eye, and secure rest by changing from point to point, instead of staring at one spot. When any particular practice does not produce rest and improvement, it is because the strain is not being relieved, and some other practice should be tried. In addition to the rest secured, the action involved calls for a positive attitude on the part of the visual center. When one has proceeded successfully from a comparison of larger letters, or objects, or lights, and from distant to nearby points, the mind has become interested and aroused, and it will begin to assert itself on the positive side. The imagination will be quickened by the memories	that is, the deep im pressions secured by the alert attention of the mind itself. It is possible to develop an improvement which will enable the visual center to demonstrate that focusing on one side of an ordinary period will make it appear clearer than the other side of the period, and even shifting from one side to the other will make the period appear to move in the opposite direction each time the glance is changed. Even if such results are not secured, or before they are secured, any deliberate and thoughtful effort to follow the instructions given for various practices will promptly demonstrate an improvement in vision. Improvement may be immediate. or come more slowly. It may be permanent at once, but it is more likely to attain that condition after repeated efforts.